Jae has been watching an old Star Trek movie on TV and El is confused! So Jae shall now attempt to explain it to El and to any readers who are also confused. That is the uniform of the crew of the Starship Enterprise. Also useful when they do Jane Fonda’s aerobics video when they’ve finished saving the galaxy. I remember when those uniforms were introduced for the film, there was HUGE uproar because they were different from the original series. But there was no Twitter in those days so nobody took any notice. Who’s that guy with the pointy ears and the magnificent eyebrows? That is Spock. He is half human and half vulcan. He is a supercool guy – supposed to be emotionless but you can tell there is a bit of a twinkle in his eye. He is the original computer expert superclever geek hero. He knows everything and is full of wisdoms. When he comes to Earth he hides his pointy ears with a woolly hat. Told you he was clever. What kind of name is Spock anyway? That’s Mr Spock to you, earthling. Probably normal for vulcan people. What kind of name is El anyway? Where are they? Some kind of planet? They are on a mission to save the galaxy. Aliens are involved but will not triumph. This is basically the plot of every Star Trek ever made. You may also know this plot from Doctor Who. You know where you are with sci fi. Except when you don’t. I like the iPads they had earlier, wouldn’t it be funny if they were playing angry birds? It probably wasn’t iPads that they had, probably some sort of futuristic timey-wimey wibbly bibbly space screens. For playing Space Invaders, or Pac Man. Lol that room is made of cardboard! Ooops, you noticed! To be fair, that was cutting edge in 1979. And at least it was real cardboard. Nowadays it would be computer generated cardboard. That is Captain James T Kirk of the Starship Enterprise. He was like the Robert Pattinson of his time, but less vampiric and morose and with a wider choice of girlfriends. Bet you can’t guess what the T in his name stands for. It’s Tiberius. You will be glad of that one day in a pub quiz, in a galaxy far, far away. Is that the Giant’s Causeway? No, that’s a space Giant’s Causeway. You used to get one free with packets of Weetabix. So now that El is full of Star Trek knowledge, the big question remains: Will she go to see the new Star Trek movie with Jae?????? Maybe, if there are sweets involved. May 1, 2013. 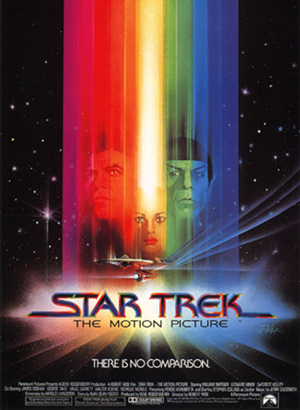 Tags: movie, star trek. Random wisdoms, Top Tips. May 9, 2013 at 9:34 am. Permalink. You forgot… under attack, everybody fall to one side, everybody fall to the other … and why do they have to make consoles of stuff that explodes at the slightest provocation? First rule of the original series… 3 main characters and a redshirt (security!) beam down… how many return? May 22, 2013 at 4:31 pm. Permalink.